Zhang Weixing is a busy person who often drinks with friends and plays the finger-guessing games (Weixing is good at the game, with a nice rhythmic voice, and is entitled "Number Two in Central China"). He is also a stubborn person when arguing with the others, so called "the head of the bull". I had one experience with him and my feeling would be best described in three words: "Oh, my God!" In some ways, such a person is vivid, humorous, and "funny". Interestingly, in the art creation process, Zhang Weixing, unlike those who only stick to a single approach, likes to try various techniques and in an experimental state to stimulate and enrich his creation. Weixing is more like a "bigot" in his friends’ eyes, one who enjoys joining the fun, and then throws his heart and soul into all kinds of craftsmanship, such as the clay sculpting, porcelain firing, tie-dyeing, stone painting, cyanotype printing, silkworms rearing, sketching ... ..., and one who seems indifferent to how others think of him. Perhaps every maze brings him a good opportunity to examine thoughts and spark inspirations, because Weixing has an abiding passion about exploring the possibilities of art in this process, and the greatest difficulty for being so-called maverick is that it will be abandoned easily once vacillates for a moment. Jorge Luis Borges said: "I spent my life reading, analyzing, writing (or trying to make my own writing), and enjoying, I found that the last to be the most important thing of all. "Since either the wise or Weixing lives with enjoyments ,there is no need to be too serious and academic to approach art, but to" enjoy" and appreciate it in a relaxing way. Either the photogram of natural objects he has mastered or the porcelain baking skills he has learned, are only to discover and present the simplicity and unusualness beneath the mediocrity, thus the previous attempts he made on techniques and experiments seemingly playful and careless, turn the “useless” into useful. Weixing spends most of his time in Songshan, Henan these years, living a happy and carefree life, in a self-exiled and enviable state. It is likely that in his eyes the creative thinking process is not as tense as in other artists’, so he observes and thinks in an abstruse and divergent way, which results in the absence of rules and systems in the appearance of his works. 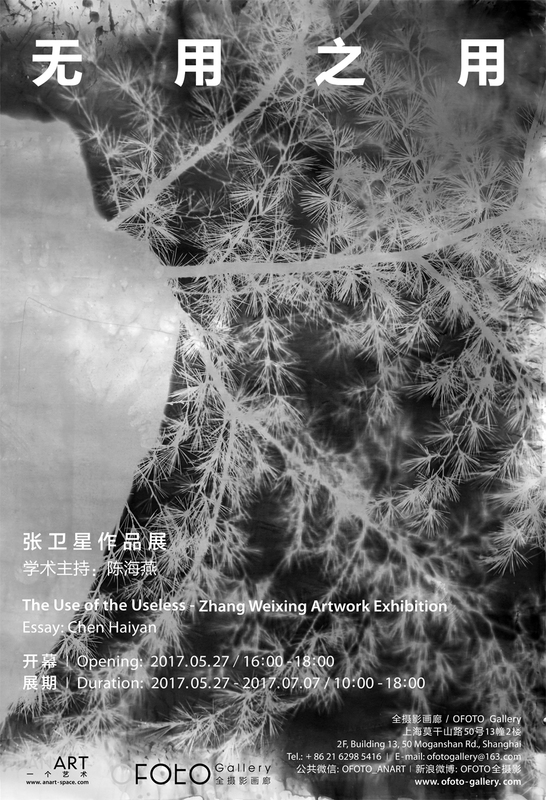 By realistic and multi-start presentations, Weixing tries to capture the invisible, indescribable air enshrouded in Songshan customs, and firmly root in the Central Plain’s thick soil. It is worth mentioning that Weixing has also been involved, these years, in children's holiday camp programs, teaching photography, having fun with them in learning the names of birds, animals and plants, which also reveals his purely innocent and natural vision. Nowadays utilitarianism and pragmatism are still dominating, coercing almost everyone's living and working principle. Fortunately, on the contrary, the traditional culture imbibed from Lao Tzu and Chuang Tzu’s “letting things take their own course”, especially Chuang Tzu's "the use of the useless is the most useful" is still existing. Thus, Weixing’s inner-directed and unconstrained spirit in “playing of art” seems some how reasonable. Just like the American Artist, Whistle said: "Art is so! ", so come the exhibitions while Weixing is playing with art.